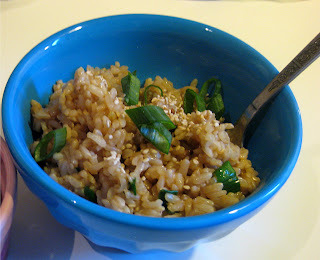 Simple delicious "fried" rice! Makes for a great quick lunch! I've always got some leftover rice kicking around in the fridge. It's "fried" rice and not fried rice because I only use a spot of oil! Try it out next time you have left over rice! In a frying pan or small saucepan over medium flame, add the rice, coconut spread, green onions and sesame seeds. Heat and stir well to prevent sticking. Once the rice is nice and hot, turn flame to medium-high and splash in some tamari and a dot of sesame oil. Stir well until it begins to sizzle. Keep stirring for about 5 minutes. Garnish with sliced green onions, sesame seeds and black pepper!